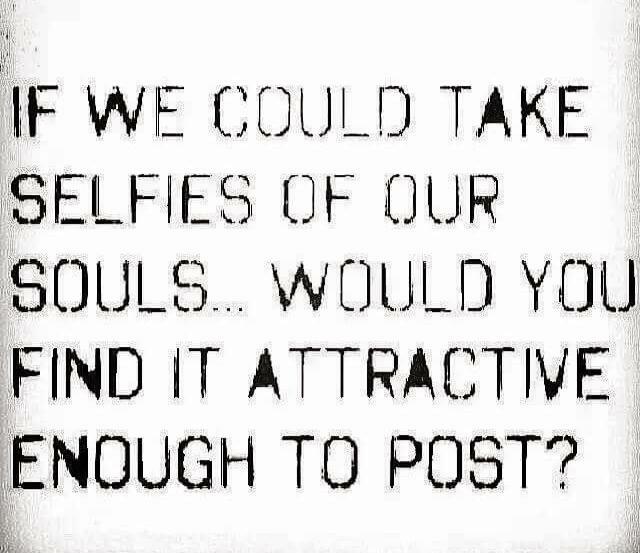 “If we could take selfies of our souls…would you find it attractive enough to post?” Scanning Facebook to wake up this morning, I had to stop to read this again and chuckle for a minute. Our daughters love to post selfies. After snapping the picture, they will blow it up on their phone examining their faces intently… too intently in my opinion. Every detail of their countenance in question, most of the time a retake is in order until they get it just right. We will take pictures together and they will look carefully at themselves and then if they are satisfied post it. When I see it, many times other people may not be at their best but that doesn’t matter if they are satisfied with how they look. So when I read this today, I thought of them blowing up the image to examine every pixilated detail of their face. I know they are not the only ones. I have seen them do it with their friends. I am blessed to have Christian teenagers who understand the meaning of modesty. They are good kids who love the Lord. However, today I am wondering if they are also carefully noting each detail of their soul? Which leads me to a far greater question, am I? I am not a selfie girl. I don’t post many of them. To be honest, I just don’t think about it. When I do post selfies, it is usually “usies” with my family or friends. We live in an appearance driven world and vanity-filled culture. It is easy to get caught up in the social media trend of selfies. But I wonder if we really spend as much time examining our souls as one might a picture they are about to post. Do we really understand the true value and worth of the soul tucked within hidden behind our heart filled with the Living Breathing Spirit of Almighty God? A soul is far too precious to be ransomed by mere earthly wealth. There is not enough of it in all the earth to buy eternal life for just one soul and keep it out of hell. You matter. Not how you look or what others think of your appearance. You matter to the Lord. When there was nothing that could save our soul from dying, Jesus came and paid the highest price. You are worth more than what others think of you. You can tell a lot about someone by what they post on social media. A picture is worth a thousand words. Some people who once graced my wall on Facebook or I followed on Instagram and Twitter are gone. I love them. I miss them. However, the posts did not reflect the person who I know. This is not a call to end social media or selfies at all. To say that social media is the problem is to say a gun has a mind of its own, it is all how one uses it. The point of this post and the message that the Lord is speaking to me today is a reminder that the most important gift that I have been given is my soul. It came at a high price and has a solid purpose. To love Jesus first. To follow Him wherever He goes so one day I can step into forever with Him. It is all about what you want out of life. I want Jesus. This requires paying attention to my soul. Using it for His Glory, not to satisfy man or even myself. I must examine it as closely as a picture I may be about to post. Blowing it up, looking at every detail, and doing things over when I find something is amiss. We must spend more time examining and inspecting what is on the inside than what we present on the outside. Ladies, this is not a call to let yourself go or put down the mascara just to pick up the Word for careful reflection instead of the mirror. Men, you are called to be the head of your home and Christ to your partner, so the most important muscle is your heart not your abs, back or shoulders. Let what God has done on the inside make its way to the outside. True humility and respect for the Lord lead a man to riches, honor, and long life. The rebel walks a thorny, treacherous road; the man who values his soul will stay away. We all want other people to like us. Respect us. Think highly of us. Acceptance and affirmation are the things we seek fulfilled by the Lord. It is a natural desire that is only supernaturally satisfied. True humility and respect for the Lord lead to godly contentment. Riches, honor and long life are attributes of the soul not our bank account or life status although the Word of God promises that God supplies all of our needs and that God’s Children do not have to beg for bread. It also says that He will not only meet but exceed our desires. It requires something though that sometimes people are not willing to give. It means putting our expectation in the Lord no other people. This does not often produce immediate gratification. It is a lifelong process of learning to love the Lord with all our heart, soul and might. (Deuteronomy 6:5-6) The very thing we seek from others comes from the Lord but it doesn’t come just by “saying” okay I love Jesus. It is achieved by obeying His Word each day until our heart and soul reflect the Light that has invaded it. If we truly value our soul, and want to be with Jesus forever than our life should reflect that change even in our countenance. Jesus reiterated what is said in Deuteronomy when He said, “Jesus replied, “‘Love the Lord your God with all your heart, soul, and mind.’ This is the first and greatest commandment. The second most important is similar: ‘Love your neighbor as much as you love yourself.’ All the other commandments and all the demands of the prophets stem from these two laws and are fulfilled if you obey them. Keep only these and you will find that you are obeying all the others.” (Matthew 22:37-40) Obeying the Lord in all things begins by self-examination. The Holy Spirit will assist in our efforts if we ask Him to. It is a pivotal shift from looking for man’s approval to seeking God’s approval in all things… even the things we post on social media. When we put ourselves out there as a believer, it should always point to Christ. He is the difference in our life. He is our game changer. Our bodies are dying day by day. We can slap some makeup on it, lift our chins until there is only one, or turn one way or the other to show our best side, but the truth is the only thing that really matters at the end of the day or better yet the end of our life is Jesus! The second commandment just killed the selfie when Jesus said we are to love others as much as ourselves. The whole Bible was given to us by inspiration from God and is useful to teach us what is true and to make us realize what is wrong in our lives; it straightens us out and helps us do what is right. It is God’s way of making us well prepared at every point, fully equipped to do good to everyone. The Bible is the best mirror to reflect the true condition of our life. We must use it daily to examine our soul and its countenance first before we worry about our face. What profits us if we gain the world’s approval or more than 100 likes and lose our soul? Nothing. When I was with my son in the hospital, each morning I took a shower and got ready for the day but it didn’t really matter to me that much about my clothes or makeup because no one was going to see me. In the quietness of hours spent serenaded by beeping monitors, and nothing to do but wait I found that I spent more and more time in God’s Word so I wouldn’t be alone. It became the mirror of my soul that it should’ve been the whole time. Over the course of four years of treatment and hospital stays, I found that I really didn’t like the person I had become before such careful introspection. Look at what it took for me to see that I wasn’t who the Lord created me to be? Now I don’t for a second believe that God gave our son cancer, or allowed the enemy to attack but He certainly used it to open my eyes. “If your eye is pure, there will be sunshine in your soul. But if your eye is clouded with evil thoughts and desires, you are in deep spiritual darkness. And oh, how deep that darkness can be!” I want sunshine in my soul. The kind that is given from experiencing the Light of His Love and grabbing hold of it. To bask in His Light, I must move out of the darkness. There is nothing good in me except what Jesus Christ is doing inside of me. I want to feed the Light and not the darkness which means I must carefully inspect my soul each day and make sure my heart and body are following suit. Our heart is fickle and must be disciplined. Our body is weak so Christ becomes our strength when we allow His Mantle of Love to cover our life. We have a purpose far beyond the affirmation of any man. We have been given the opportunity and undeserved privilege of righteousness or right standing with God again. We can be His Children. He can be pleased with us again. My soul is the access point of God’s Acceptance, Affirmation and Affection. To offer it to Him allows me to live with sunshine in my soul as the Light of His Love overtakes me. I am always thinking of the Lord; and because he is so near, I never need to stumble or fall. Heart, body, and soul are filled with joy. For you will not leave me among the dead; you will not allow your beloved one to rot in the grave. You have let me experience the joys of life and the exquisite pleasures of your own eternal presence. I am always thinking of the Lord. Wow, that is a direct statement and high aspiration for our life. Are we always thinking about Jesus especially when we put our life on display? He is the Source of Life for those who call Him Savior and Lord, do we live like it? When people see our selfies or posts on social media, I wonder if their first thought is that I love Jesus or I love myself. Good question and one I think we all need to ask in every situation and encounter in life. Nothing good lives in me and all the good things about me are directly attributed to Christ. When they see me, do they see Jesus? When they hear me, do they hear about Him? When they know me, can they tell that He is my everything? It’s time to take a soul selfie. Blow it up. Look deep within at every detail and make the necessary changes to be more like Jesus. Why? I want to live in His Presence forever. I want others to experience the life changing love that I have found. Those who give their heart, body and soul to Jesus will be filled with joy and satisfied just to have Him near. If you decide to put yourself out there today on social media or real life, make sure that it honors, glorifies and magnifies the One who loves you most and paid the highest price to satisfy your soul! Rouse yourself, my soul! Arise, O harp and lyre! Let us greet the dawn with song! I will thank you publicly throughout the land. I will sing your praises among the nations. Your kindness and love are as vast as the heavens. Your faithfulness is higher than the skies. Yes, be exalted, O God, above the heavens. May your glory shine throughout the earth.